The deadline to renew your SNEB membership is today, Feb. 1. This will be your last issue of the eCommunicator if you have not renewed your membership. 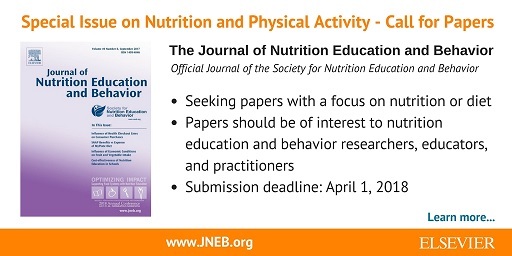 Renew now to not miss an issue of JNEB, to join one of the two new SNEB divisions, and to continue free access to upcoming webinars including the Spring Journal Club series. Renew here. Conference will begin with pre-conference sessions and tours on Saturday, July 21 with the opening reception that evening. The opening day keynote is the morning of Sunday, July 22. Conference sessions end at 5 p.m. on Tuesday, July 24 with several post-conference sessions and tours on Wednesday, July 25. More program details coming soon but reserve rooms at the host hotel, the Hyatt Regency Minneapolis. A student housing option is being confirmed. The objective of this study was to examine the strategies and behaviors caregivers use to manage the household food supply when their children experience food insecurity as measured by the US Department of Agriculture's Household Food Security Survey Module. Cross-sectional surveys including open-ended questions about strategies and behaviors used to manage the household food supply were completed with caregivers who reported food insecurity among their children (n = 746) and were analyzed using emergent and thematic qualitative coding. Caregivers use a wide variety of strategies and behaviors to manage the household food supply when their children are food insecure that are consistent with common nutrition education suggestions, including those provided through person-level SNAP-Ed. Changes to dietary quality because of food insecurity may have either positive or negative effects on dietary quality but may also have psychological implications. Application of Policy, System, and Environment (PSE) strategies like those found in the SNAP-Ed toolkit could strengthen and support individual strategies and behaviors in reaction to food insecurity. Participants will be able to identify the types of strategies and behaviors caregivers use to manage the household food supply when their children are food insecure. Participants will be able to describe how strategies and behaviors caregivers use to manage the household food supply when their children are food insecure relate to common nutrition education suggestions, including those provided through person-level SNAP-Ed. 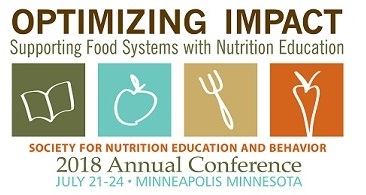 Participants will be able to describe the psychological and dietary quality implications of strategies and behaviors caregivers use because of food insecurity. Participants will be able to describe how the Application of Policy, System, and Environment (PSE) strategies found in the SNAP-Ed toolkit could strengthen and support individual strategies and behaviors in reaction to food insecurity. This webinar will provide a forum to highlight the results of current WIC breastfeeding efforts and to discuss the impact of breastfeeding on childhood obesity among WIC participants in California. Shannon E. Whaley, Ph.D., Director of Research and Evaluation at PHFE WIC, the largest local agency WIC program in the country, will present the work her team recently completed on a sample of over 40,000 WIC infants followed to age 4. Results suggest that every month of breastfeeding confers positive health benefits for children, as evidenced by lower rates of obesity at age 4. Ample Q&A time will be provided for audience questions and comments. Identify the reach of WIC to over half of all infants born in the US. Describe WIC program services and important links between WIC and positive health outcomes of women and children. Describe the role of breastfeeding in attenuating obesity rates in Hispanic children enrolled in WIC. Food access and equity are increasingly relevant when nutrition professionals consider improving the quality of people’s diets. Many nutrition educators in Extension work within two of the USDA low-income nutrition education and obesity prevention programs, SNAP-Ed and EFNEP. The role of the built environment in the diets of Americans is more understood, and it is widely accepted that the places where people live, learn, work, play, and shop affect their food and physical activity behaviors. It is essential that participants of SNAP-Ed and EFNEP have access to nutritious foods so that direct education efforts by Extension educators are successful in improving health behaviors. The food pantry is a common setting for direct education interventions and is growing as a place for policy, systems, and environmental change. Environmental interventions within the food pantry setting improve healthy food access and equity to low-income clients who are served by SNAP-Ed and EFNEP through Extension programming. As such, the role of Extension educators has widened in the types of technical assistance and support Extension educators now provide to food pantry agencies and their clients. This talk will examine the development, theoretical foundation, evidence of feasibility and acceptability, and effectiveness of "Together, We Inspire Smart Eating" (WISE). WISE is a research-based curriculum developed to target preschool and elementary school children attending schools serving children from low-income backgrounds. WISE includes three key components: (a) the classroom curriculum including the mascot, Windy Wise, a barn owl, (b) educator training, and (c) material/technology to educate parents. The classroom curriculum encourages increased consumption of fruits and vegetables, fosters healthy attitudes and behaviors towards trying new healthy foods, and strengthens children's agricultural literacy. Process evaluation results will include an overview of implementation success and barriers. Outcome evaluation will include changes in educator knowledge and behavior, parent report of dietary intake compared with children not receiving WISE, and Skin Carotenoid pre/post assessment of consumption. The participants will review the theoretical foundation for an obesity prevention program that targets vulnerable populations as defined by lack of financial resources. The participants will link this foundation to the key components of the WISE curriculum. The participants will discuss the implementation barriers WISE presented and the team's efforts to address. The participants will examine the outcomes of the multiple methods outcomes assessment and recommendations for future community-based interventions. We are pleased to announce the launch of our new job board and career center! We've been hard at work to offer this resource to both job seekers and employers and today we’re excited to announce its official release. You can look forward to some great improvements, including free internship postings, a resume search bank, job alerts, an easy-to-use experience on mobile devices and more! Members can use code snebmem18 to access the member discount and save 50 percent on all postings. Visit jobs.sneb.org to search for jobs and find the best candidates for your positions today. This chart shows JNEB's CiteScore — a measure of the average citations received per document published. CiteScore values are based on citation counts in a given year to documents published in three previous calendar years, divided by the number of documents in these three previous years. In 2015, JNEB had a CiteScore of 1.83. In 2016, the CiteScore increased to 1.98. Click here for more JNEB charts and statistics. 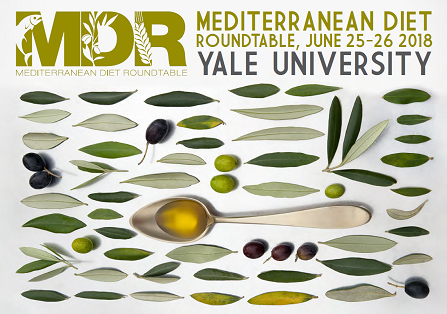 Mediterranean Diet Roundtable 2018: Learn. Connect. Be inspired! APHA Food & Nutrition Section Call for Abstracts OPEN! Is food talk from parents connected to children's obesity?